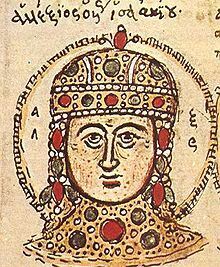 Alexios IV was Byzantine Emperor from August 1203 to January 1204. He was the son of Emperor Isaac II Angelus and his first wife, an unknown Palaiologina. On 18 July 1203 the Crusaders launched an assault on the city, and Alexios III immediately fled into Thrace. The next morning the citizens had released Isaac II from prison and proclaimed him emperor. The Crusaders could not accept this, and forced Isaac II to proclaim his son Alexios IV co-emperor on 1 August. Soon hostility between the restive Crusaders and the inhabitants of Constantinople was growing. In December 1203 violence exploded between the citizens of Constantinople and the Crusaders. Enraged mobs seized and brutally murdered any foreigner they could lay hands upon, and the Crusaders felt that Alexios had not fulfilled his promises to them. Alexios refused their demands, and is quoted as saying, "I will not do any more than I have done." While relations with the Crusaders were deteriorating, Alexios had become deeply unpopular with the Greek citizenry, and with his own father. At the end of January 1204, the populace of Constantinople rebelled and tried to proclaim a rival emperor in Hagia Sophia. Both Alexios IV and his father were imprisoned. Isaac II died soon afterwards, possibly of old age or from poison, and Alexios IV was strangled on 8 February.